You look like you are having too much fun with this test. 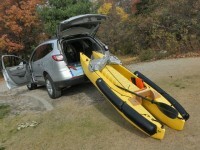 I think you might be secretly hoping someone puts a 4 cylinder inboard in one so you can test that too. Lol. 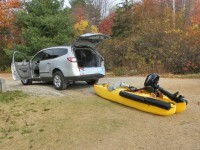 Knowing a boats limits and stepping back a bit from those for safety is always a good idea. Thanks for testing it out. 10 km/h is 6.2 mph, and 6 kg is 13.2 lbs. A 70 lbs electric motor weighs about 20 lbs. 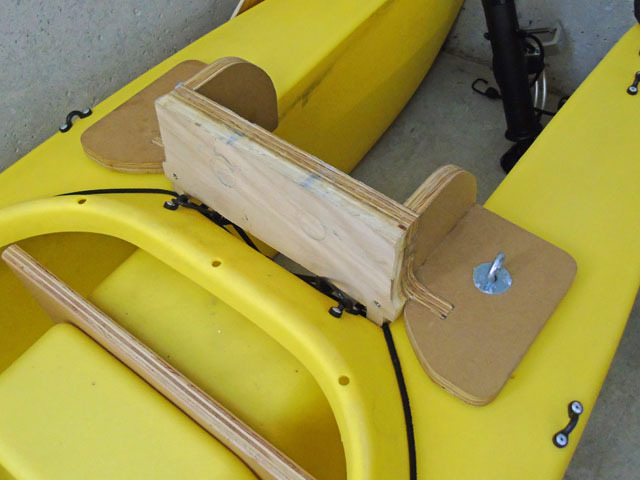 By this he means that he stores the batteries at the bottom of the W kayak’s hulls, so they rest below waterline and thus don’t add instability. 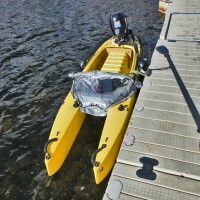 In contrast, most of a gas outboard motor’s weight is concentrated above the kayak’s deck, which is a destabilizing factor. 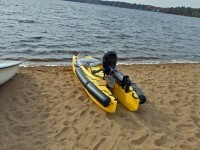 As far as weight is concerned, (2 x 13 lbs) + 20 lbs = 46 lbs, which is 1/2 more than the 2 hp air-cooled gas outboard motor that we normally use, and about 1/4 less than the weight of the 6 hp Tohatsu outboard that we tested for this article and video. In terms of power and speed, 6 mph is pretty good, but it’s hardly enough when the wind blows in your face and the lake gets choppy. This article got me a little confused… The first paragraph talks about overpowering but the video looks good and there’s no apparent problem, and there’s so much information to digest.. So what’s the bottom line, what’s the biggest problem with this 6HP setup? Is it stability? safety? power? or maybe I missed something?.. Torque is the main problem that we see at this point – The extreme power to weight ratio in this configuration is almost absurd, and this makes this craft very ‘nervous’. Every little twist of your wrist can instantly deliver a huge spike in RPM – It may not be such a big increase in absolute terms, but because its impact on the boat is so strong it feels like it could make you lose control. You almost feel like it’s jumping. The closest thing that’s comparable is riding a very strong but untamed horse* – you know that you just can’t afford to make a mistake. Once the weather gets warm again, next year, we’ll try to spend more time driving it. Playing with the motor’s throttle friction adjustment screw could help reduce the likelihood of accidentally turning the throttle too quickly in the wrong direction. True, but over-tightening can be dangerous as well, since it might lead to loss of control if the driver can’t reduce power fast enough in case of an emergency. In the end, it’s much about getting used to driving this thing through a lot of practice. I’m thinking about a 3.5 Tohatsu with a 20 inch shaft. 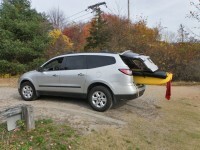 Could you show how you reinforced the 2015 transom mount? A motor featuring a 15″ (short) shaft cannot be mounted directly behind the cockpit because of the need for enough room for the clamp screws that attach it to the mounting plate. 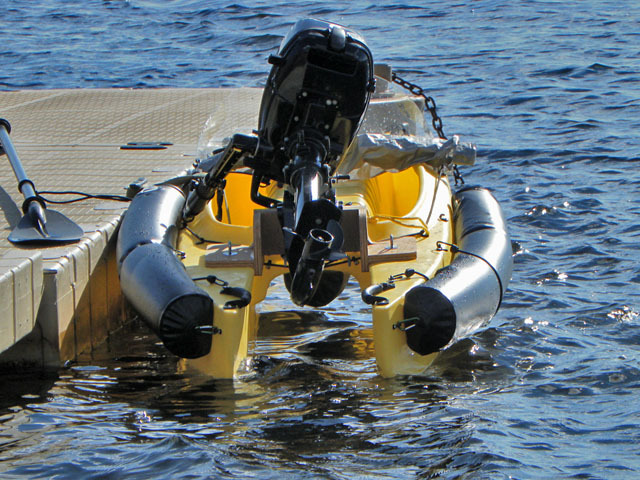 Outboard motors that are over the 2-3 hp range should feature only a 20″ long shaft. This is because of their higher weight, and because they must be close to the user in order to be accessible and easy to steer. This is important both for convenience and safety. I think Yoav’s statement about “Practice makes Perfect” truly says it all. 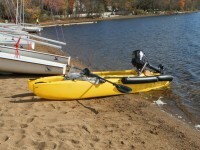 The 6-HP motor turns your micro-skiff into a “specialized vehicle” the requires a skillset that “beginners” simply don’t possess. However, if your reasons for having the powerful powerplant are necessary for what you want to use it for, go for it… Just be careful. I wanted a micro-skiff (small boat I could transport in my pickup bed) that I could run lights, radios, and other accessories that I can use for comfortable (safe) night fishing in a bay that oftentimes gets rough (white-caps/big waves/high winds) really quickly. 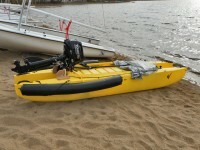 The 6-HP (sail-pro) was the smallest motor I found that had an alternator already built in. 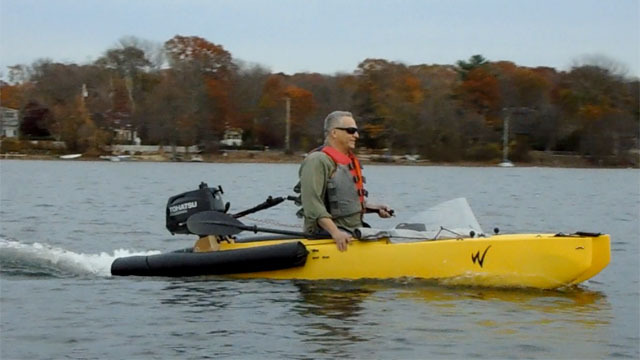 In my case, I am basically building a customized boat “around” the W500’s GREAT “bones/frame/platform” to suit MY particular needs, even though it was an incredibly capable fishing kayak when I first picked it up. Thank for reminding us about the alternator – This is a feature that some people may be interested to know more about. 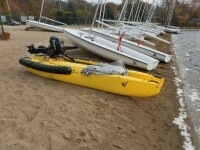 It’s a standard feature in the Sail-Pro models, but you can add it to the other 6 hp Tohatsu models as well. What it does is enable you to recharge a battery on board. 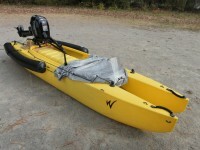 You can use the battery to power a small trolling motor, lights, etc. Since the 6 hp Tohatsu features a 3 position gear, you can run the motor on idle, and charge whatever electric device you have on board. It’s pretty cool, although not cheap. OK, when and where is the race between Yoav and One-Shot. My money is on One-Shot. is this a w mokai? 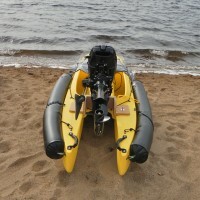 I have never driven a Mokai, and all I know about it are things that a couple Wavewalk clients who had owned such a boat in the past have told me (they liked it), and what I was able to learn through watching online videos and reading tech specs. 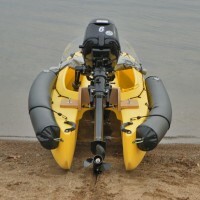 The Mokai has been around for many years, and the W570 overpowered by a 6 hp outboard is a concept that’s still at an experimental stage. Yes. The first was Andy Kumler, a fly fisherman from Oregon, who used his Mokai for going in fast rivers, on his way to fish trout, salmon, etc. He later got a W300, and contributed a review and a video to our website. The second is Steve Lucas, from southeastern Florida, who used his Mokai for fishing trips in the everglades and the flats in his area. Steve recently contributed a great review of his W500, and some nice movies. He had plans to motorize his W500, but he still hasn’t done so, as far as I know. 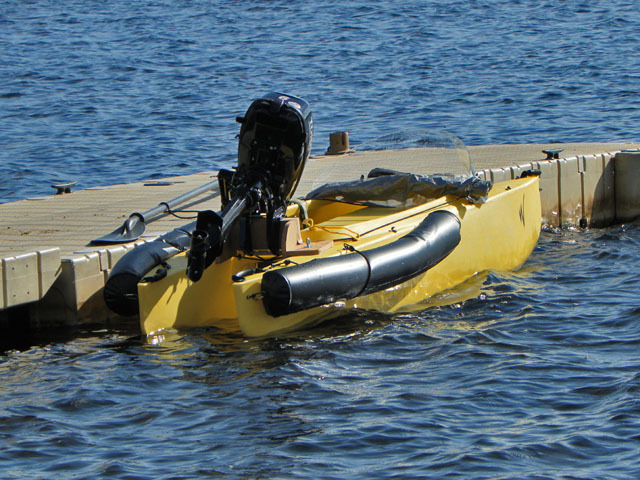 Generally, jet drives work better in very shallow water (‘skinny’ water) than outboard motors do, but we won’t develop a jet drive because we don’t think that the average user has the technical skills required to maintain and repair such specialized motors. The unbeatable advantage that outboards offer is that you can easily find a local dealer or mechanic shop that would take care of your motor if you live anywhere in the US and Canada. It’s the most convenient solution. Besides, cleaning an outboard’s propeller from weed is easy, and so is replacing it. In general, outboard maintenance is the easiest. The second advantage that outboard motors have in this case is that they’re less heavy than comparable jet drives. 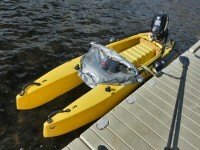 A motorized W is a lightweight car-top boat, and we’d rather keep it as lightweight as possible. BTW, the 6 hp Tohatsu outboard features a shallow water position for its propeller. We haven’t yet had the time to test it, but it’s worth mentioning in this context. PS — The W features twin Hulls used for carrying passengers and gear. A pontoon is a closed buoyant structure that isn’t used for carrying passengers or cargo. 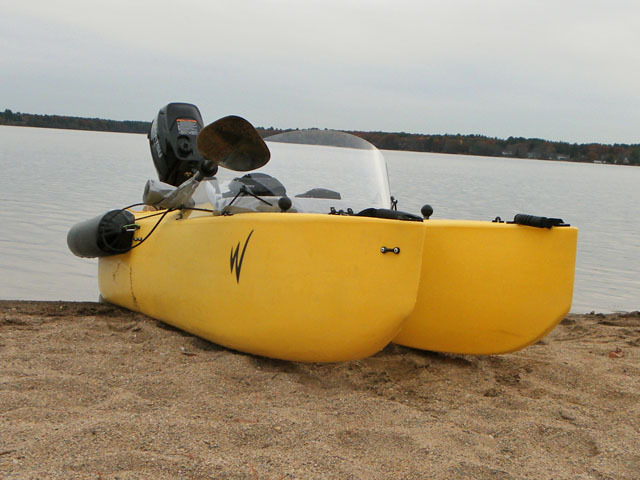 MacReel, there are special outboard motors for rocky rivers, shallow water and mud.They’re called mud motors or backwater motors, and they weigh just a little more than outboards in the same power range without being much more expensive. You can mount them on any small boat, and I bet you could do it on a WaveWalk too. I wouldn’t be so sure mainly because those mud motors are designed for wider boats with a square stern and a driver standing up. It might be possible to mount such a thing on a w if the steering frame is modified. I’m thinking that it may be easier and cheaper to outfit the propeller of a regular outboard with the kind of sturdy protection fins and collar that mud motor propellers feature, and drive in the “shallow water” position. It might not be a perfect solution like a jet drive or a mud motor, but at least it would be more versatile and practical. I hear that jet drives can get clogged by debris in shallow water. I thought you’d like to know that.